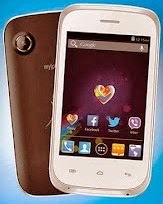 After the release of "Myphone Agua Rain 3G", Myphone also released Myphone Rain 2G afterwards, basically the phone is 2G, that means it has a slower data connection usually EDGE or GPRS. Well, hold on there since there has a good alternative for that, the WiFi of course and a 1K cut down to its price (P1,988). We can't expect that the whole country will have a WiFi hotspot, so another huge let down right? 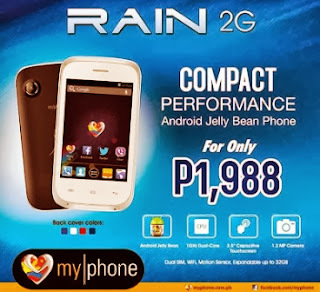 What if I tell you Myphone Rain 2G is JellyBean 4.2.2, bottom line is "My phone (literally) is only 2K and its JellyBean" like a boss. Being a cheap phone doesn't come perfect in all aspect, the RAM of course is a little bit low, still quite enough for some apps, and the internal storage, I bet a 100 MB will be left as usable. 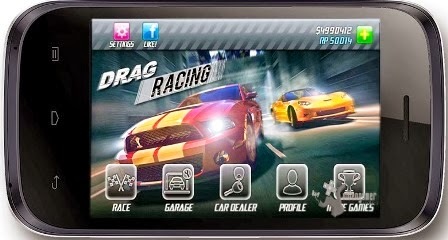 All in all a standard smartphone that reflects it cost cheaply and effectively. For Php1,988 (Suggested retail price), available now in the Philippines nationwide, mostly first on MyPhone Stores in key cities.